Most of us tend to think of roadtrips as requiring several days to complete, and this doesn't include planning time. What's easy to forget is that road trips can also be short and spontaneous. Think for a moment. Isn't there some special place, a back-road byway, a pretty street in your city or town, or a route through a nearby park that's no more than thirty minutes from where you're sitting? It's probably a place you rarely visit because it's so familiar and close to home. Have you thought of such a place? If you have, you've already planned a two-hour roadtrip. Last Saturday afternoon, we were in front of our computers working on the latest edition of RoadTripAmerica.com. Somehow, the thought occurred to both of us that we were wasting a beautiful winter-in the-desert day. 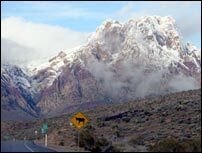 It wasn't long before we were in the car and headed to Spring Mountain Ranch State Park, a preserve on the outskirts of Las Vegas, Nevada. The entire round trip distance was less than 44 miles, and we were away from our desks for less than two hours. But what a glorious break! Within five minutes of parking, we found ourselves wandering along a sparkling stream. Suddenly, a four-point buck leapt through the sage brush not fifty yards in front of us. We heard a couple of wild burros yakking from a ridge, and we watched coots and ducks swim in a pond ringed in bull rushes. All of this was in addition to awesome views of the brilliant sandstone cliffs of Red Rock Canyon. ROADTRIP IS A STATE OF MIND. Roadtrips don't have to be measured in miles, and they don't even have to cover new territory. Every time you go somewhere, it's different, you're different, and it's a different day. You can sit in one spot for a year, and you're still on a journey. The key is remembering that fact. The road's always rolling under you. All you have to do is notice. It's also helpful to remember that two-hour road trips don't have to include any out-of-vehicle time. How about a quick drive around a local college campus, or a drive into the hills or along a shoreline? Likewise a drive through a particularly attractive neighborhood in your town or even a cruise along an Interstate with no particular destination can offer a delightful break from routine. Something as mundane as a trip to the grocery store can be a roadtrip if you take a new route. It's often very easy to add a little "extra" to "ordinary." and then share what you found on the Great American RoadTrip Forum!